Are you wondering what all hype is about? Why visit Brazil now? We have 10 great reasons for to make Brazil your next vacation destination. 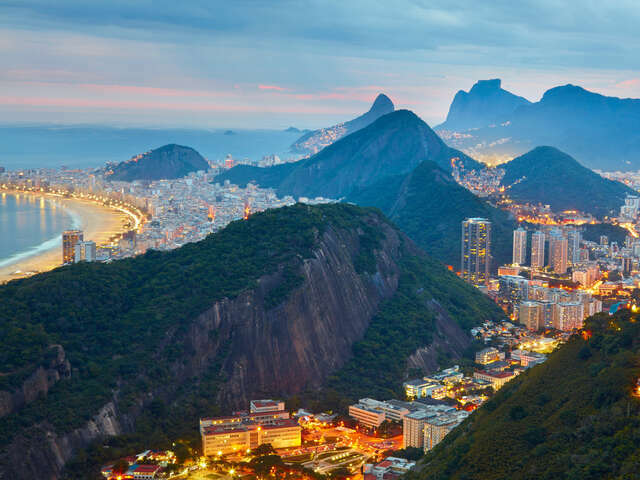 The Olympics has placed Brazil atop the world’s podium as a must-see destination for many would-be travellers. As the games unfold, searches online for travel to Brazil sky rocket. Are you wondering what all hype is about? Why visit Brazil now? We have 10 great reasons for to make Brazil your next vacation destination. Did you know that Brazil has more than 2,000 beaches stretching along its shoreline and more than 1,000 islands dot the Atlantic Ocean within the country's limits. While many of them are densely populated, many are preserved ecological sanctuaries. Of course none are more famous than Rio’s Copacabana Beach photographed here. The Amazon Rainforest and Iguassu Falls were well known around the world prior to the Olympics being held in the country. These are the most famous attractions in the country, but there are at least 62 national parks and hundreds of other conversation units throughout the area. Brazil holds several records for its wildlife numbers and diversity. The festival draws in party-goers from all over the world. Elaborate costumes, street dancing and parties carry-on throughout the day and into the night right until dawn. Rio has set the global standard for Carnaval and it is an experience well worth adding to your bucket list. If Rio is not in the cards for you this Carnaval season, the country also holds Carnaval festivals in Salvador, Recife and Olinda. The country offers visitors amazing places to stay that could become the destination themselves. Rainforest lodges are becoming more and more popular and upscale hotels are increasing in demand by a booming business travel industry. Charming pousadas are also great places to rest a weary head as they offer a unique local experience. As these trend grows, so do the number of accommodation offerings. Great chefs, inspired by the country's diversity of native ingredients and regional traditions, are writing a whole new chapter in Brazilian food. One of the best ways to get in touch with this diversity is through one of Brazil's many food festivals. Brazil's Ministry of Tourism and state and city administrations are investing as seriously in the area as the private sector. That translates into better roads, more jobs, an improvement of community life, and many other benefits that are turning Brazil into a more desirable destination than ever before. For hundreds of years, Brazilian culture has been in the making by its people who have a very diverse ethnic and cultural heritage; the country prides itself on having a multi-cultural population. This diversity allows visitors to share in a variety of experiences; dancing, food and so much more. Locals are welcoming to tourists and it's safe to say that the people who have created Brazil are, as a rule, friendly to foreign visitors. A trip to Brazil wouldn’t be complete without taking in a soccer match. You are sure to enjoy yourself and talk about the experience for years to come. With Brazil being the home to the one of the best soccer team in the world, you know you’ll have a sports experience of a life time when attending a match. The Brazilian Soccer Culture is definitely not to be missed. We’re not saying it never rains, but Brazil does boast about its 300 days of sunshine annually. Fall and winter is a great time to go, with cool sunrises, a general shedding of sweaters during unbelievably bright sunny days and clear, chilly nights which are perfect for cuddling by the fireplace. Many travellers to Brazil make it home-base and do trips to neighboring countries such as Argentina and Peru or take a flight further south and visit Patagonia. Adventure travel, rest and relaxation and luxury travel are all options when planning a trip to South America’s most visited country. Give us a call and we would be happy to tell you all about amazing deals for the style of travel you prefer.